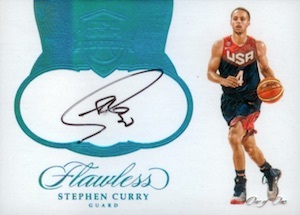 Ending the '16-17 NBA hobby season with a flourish, 2016-17 Panini Flawless Basketball again pushes the limits of high-end collecting. 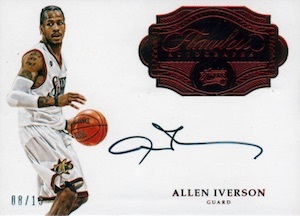 Only featuring on-card signatures, the boxes offer seven autographs (with one encased), one autograph/memorabilia/diamond card, one memorabilia card, and one encased diamond base card. Although the same basic 10-card box format is continued from the 2015-16 set, the output has some tweaks. Still, the quality remains, as does a low production rate the means every card is numbered to 25 or less. 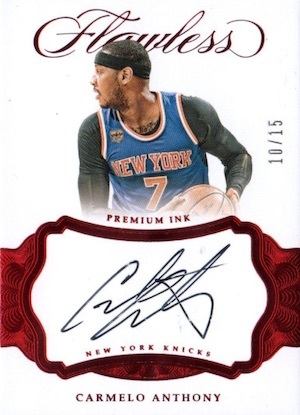 The main change collectors are likely to notice comes in the base 2016-17 Panini Flawless Basketball checklist. Diamonds were always a major component of the set, but now they are the only gem to be found, replacing the rubies, sapphires and emeralds of the past. In addition to the base Single Diamond (#/25) are Double Diamond (#/10), Triple Diamond (#/5), and Platinum Diamond (1/1) editions. Falling one per box, all base cards and parallels are encased. 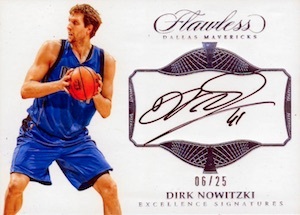 Promising one sealed autograph and at least six more signed cards, 2016-17 Panini Flawless Basketball maintains the premium appeal with many inserts signed directly on the card. 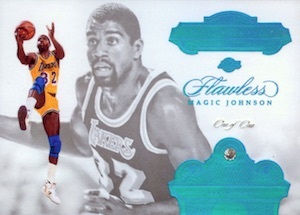 Greats naturally highlights NBA legends like Kareem Abdul-Jabbar and Shaq. Pairing autograph and relic, Star Swatch Signature cards showcase an oversized patch piece for a mix of subjects from current and prior seasons. The popular Dual Patch Autograph set is also back with a new look and more top names. Another choice is found with Jumbo Patch Autographs. 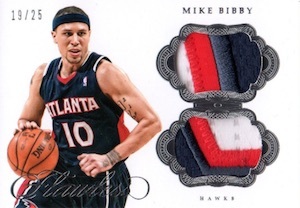 Long a collecting "white whale," the Logoman Autograph inserts carry a print run of just one copy and feature the iconic NBA logo patch. 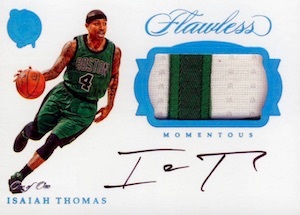 Moving to the back of the jersey, Championship Tag Autograph cards are equally impressive with the actual jersey tag noting the number of championships for the franchise in question. 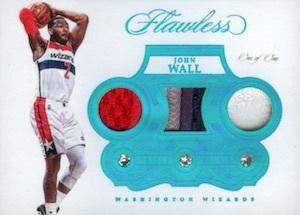 Loading Flawless up with more goodies, Triple Double may sound simple enough, but it actually fulfills the "triple" part with both three memorabilia pieces and three diamonds. These also have a Platinum parallel with jumbo diamonds. 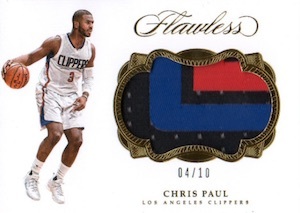 See the available 2016-17 Flawless NBA listings on eBay. 100 cards. Serial numbered #/25. PARALLEL CARDS: Double Diamond #/10, Triple Diamond #/5, Bronze #/2 (1st Off Line), Platinum 1/1. 82 cards. Serial numbered #/25. 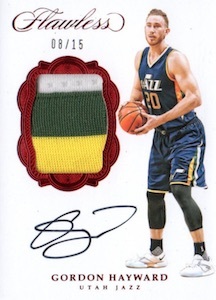 PARALLEL CARDS: Ruby #/15, Gold #/10, Emerald #/5, Platinum 1/1 (No Devin Booker, Magic Johnson*). GOLD PROOF PARALLELS: Gold Proof #/2 or less, Ruby #/2 or less, Emerald 1/1, Gold 1/1. 12 cards. Serial numbered #/25. PARALLEL CARDS: Ruby #/15, Gold #/10, Emerald #/5, Platinum 1/1. GOLD PROOF PARALLELS: Ruby #/2, Gold Proof #/2 or less, Gold 1/1, Emerald 1/1. VERSIONS: Gold #/10 or less, Emerald #/5, Platinum 1/1. PARALLEL CARDS: Gold #/10 or less, Emerald #/5 or less, Platinum 1/1. View specific options with the spreadsheet. VERSIONS: Gold #/10 or less, Emerald #/5 or less, Platinum 1/1. 20 cards. Serial numbered #/5. 40 cards. Serial numbered #/2. 13 cards. Serial numbered #/2. 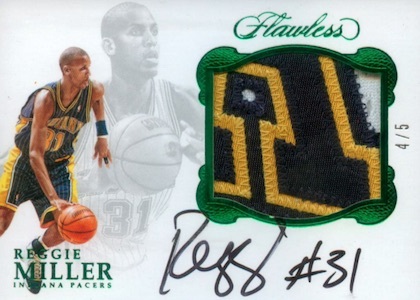 VERSIONS: Ruby #/15 (Reggie Miller - #/12*), Gold #/10 (Reggie Miller - #/8*), Emerald #/5, Platinum 1/1. 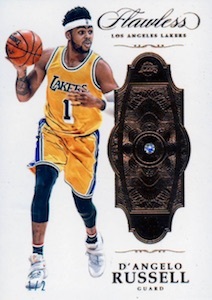 PARALLEL CARDS: Ruby #/2 (Wilkins, Redick only*), Emerald 1/1 (Reddick, Stockton only*), Gold 1/1 (Redick only*). PARALLEL CARDS: Gold #/10 (Ainge/Bird - #/8; Green/Curry - #/7*), Emerald #/5 (Westbrook/Adams - #/4*), Logoman 1/1. 65 cards. Serial numbered #/25. All subjects not included in Gold Proof parallels. View specific options with the spreadsheet. 29 cards. Serial numbered #/25. GOLD PROOF PARALLELS: Gold Proof #/3 or less, Ruby #/2 or less, Gold 1/1, Emerald 1/1. 35 cards. Serial numbered 1/1. 22 cards. Serial numbered 1/1. 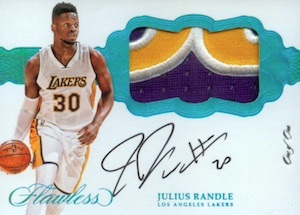 VERSIONS: Ruby #/15 (Randle - #/10; Harden - #/11*), Gold #/10 or less, Emerald #/5 or less, Platinum 1/1. 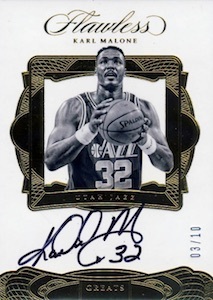 PARALLEL CARDS: Ruby #/2 (Parker, Hezonja only*), Emerald 1/1 (Carter, Sabonis only*), Gold (Sabonis only*). PARALLEL CARDS: Gold #/10 or less, Emerald #/5, Platinum 1/1. VERSIONS: Gold #/10 (DeAndre Jordan - #/8*), Emerald #/5, Platinum 1/1. 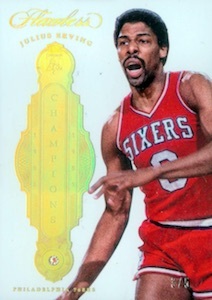 GOLD PROOF PARALLELS: Gold Proof #/2 or less, Ruby #/2 or less (Stackhouse - #/4*), Emerald 1/1, Gold 1/1. VERSIONS: Ruby #/15 (Pau Gasol - #/12*), Gold #/10 (Pau Gasol - #/8, Richard Jefferson - #/9*), Emerald #/5, Platinum 1/1. 10 cards. Serial numbered #/5. 15 cards. Serial numbered #/3. PARALLEL CARDS: Silver #/20, Ruby #/15, Platinum 1/1. It is expensive. YES. But the last time I bought one box, I was able to get Giannis Auto RC. So it was worth it. The only bad here is the player selection. Some of them doesn’t deserve to be here. Keep rookies, hall of famers and championship players only for this roster.